2010 was the strongest year for open access growth so far. 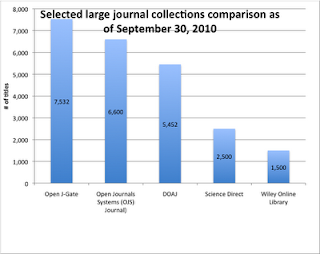 In 2010, 1,401 journals were added to DOAJ for a total of 5,936 journals. The Electronic Journals Library now records over 27,000 journals that can be read free of charge; over 3,500 were added in 2010. 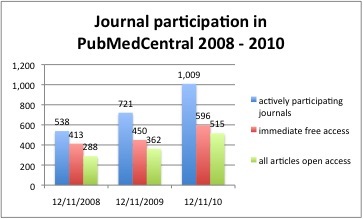 1,037 journals actively participate in PubMedCentral, an increase of 313 over the past year, and more than half of these journals contribute all articles as open access. PMC now provides access to over 3.2 million free articles, an increase of over 300,000 this year. OpenDOAR lists 1,817 repositories, having added 257 this year. 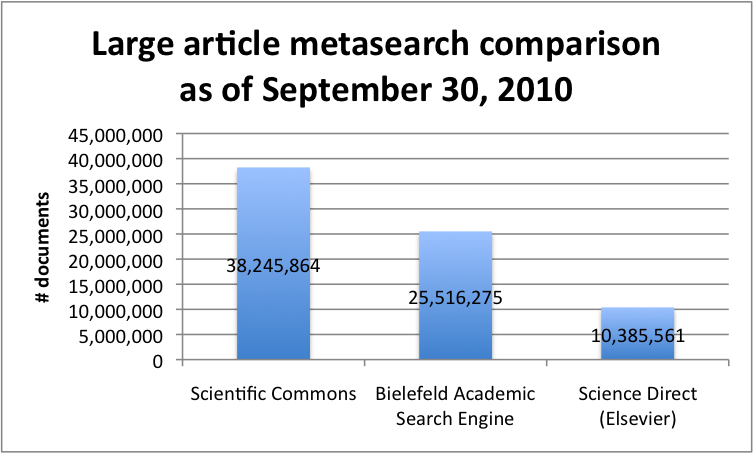 A Scientific Commons search encompasses 38 million items, an increase of over 6 million since last year. There are 261 open access mandate policies, an increase of 83 this year. Open access mandate policies showed the strongest growth in percentage terms, with a 90% increase in thesis mandates and a 61% increase in departmental mandates, 47% growth in total mandates, and 41% growth in institutional mandates. For links to full details and charts on OA mandate growth, see this post by Alma Swan. A total of 7 measures showed growth of 40% or better, including DOAJ's journals and articles searchable at article level. 7 measures showed growth of 30% or better, including the number of journals in PMC with immediate free access (37%) and the number of journals in PMC with all articles open access (34%), the number of peer-reviewed journals included in Open J-Gate (36%), and the total number of journals included in Open J-Gate (31%), the number of repositories listed in ROAR (34%), and the number of proposed open access mandates (33%). A further 11 measures were 10% or better, including BASE content providers, RePEC (both total items and items available online), and the number of documents in E-LIS and arXiv. New this issue: historical data has been added to the full data edition (see the DGOA Dataverse to download), thanks to Tim Gray of Homerton College Library) and the Internet Archive's Wayback Machine. The show growth issue focuses on 2010 growth, and includes columns for average daily, weekly, and monthly growth for illustration purposes. New additions include Mendeley and the open data journal policies list at the Open Access Directory (the latter as a first foray into tracking the dramatic growth of open data). A first edition of The Dramatic Growth of Open Access Rationale and Methodology is now available for download from the DGOA Dataverse or for viewing as a Google Doc. For full data that is downloadable as the Dec 31 2010 full data edition or the Dec 31 2010 show growth edition, see the DGOA Dataverse at Harvard; for quick web viewing of the latest data, see the Google Docs Show Growth version. For links to all versions and commentary, see the Dramatic Growth of Open Access Series. This post was updated Jan. 1, 2010, adding links to Alma Swan's post and the services listed below, and on Jan. 2, 2010, adding links to the Polish version created by E-LIS Editor Bożena Bednarek-Michalska, which can be found here and here. Updated again Jan. 4, adding this link to MIT stats showing the popularity of open educational resources. A Happy New Year to everyone in the open access movement! The open data movement is closely related to the open access movement, and of great interest and use to scholars. It is obvious that there is a lot happening; currently one of my best sources of information is Tracey Lauriault of civicaccess.ca and datalibre.ca fame. As an aside, it is a little ironic that data phenomenon / statistician Tracey is the source par excellence for qualitative information on this matter, whilst I, the critical scholar rather inclined to look with scepticism at purely quantitative research, am apparently the volunteer keeper of the quarterly statistics for the open access movement. Glen Newton points to the 70 online databases that define our planet, from Technology Review, the arXiv physics blog, as further qualitative evidence that there is a lot of quantitative data out there already. This chart by Peter Hendrik, President, Springer STM Publishing, from Hendrik's presentation at the 2010 Berlin Open Access Conference in Beijing, (based on information from Thompson-Reuters) predicting possible OA article growth at 20% compared to total article growth of 3.5% by 2020 is well worth noting. Why is this worth noting? Interesting as this projection is per se, the reason that this is important is because it reflects two players very much from the commercial traditional subscription journal market predicting stronger growth of open access articles than overall article growth. The two players are Springer and Thompson-Reuters. Such predictions are not new, of course; I have been making similar predictions for years. So what is new is not the prediction, but who is making the prediction. To the best of my knowledge, this is new; but if I am wrong, please correct me. Many thanks to Hendrik for this presentation, and to A. Ben Wagner for pointing to the citation. This originally came to my attention through Stevan Harnad at the American Scientist Open Access Forum, who posted the chart linked to above in order to critique it. Harnad has posted to the effect that he thinks my brief interpretation of the chart he posted (i.e. much higher OA article growth than total article growth predicted) is full of errors. My perspective on this is that Harnad is missing the forest (the fact that it is now traditional commercial subscription publishers seeing and predicting strong open access, an excellent omen for future OA growth - if these folks are seeing the potential of OA, they have the ability to push it further forward and the incentive to do so) for the trees (the details of the numbers - from my point of view, this is forecasting and I have no concern with whether the forecast is correct or not. My perspective is that there is sufficient open access out there - archives, journals publishers - to prove the concept. The Springers of the world may need to forecast due to their commercial nature, but for most of us this is not necessary - what we need to do is not to forecast, but rather to adopt and implement strong open access policy, infrastructure for OA publishing and archives, and shift the economics to OA, to make it happen). Excellent free cash generation = when we send in our subscription payments, they have tons of cash on hand. In ordinary household terms: when you get your paycheque, the money is not all going to pay the bills right away, you pay these off and have lots of spending money. High return on capital employed = for what they spend on getting the journals, they get way more money back. High margins especially on data and subscription revenues with high renewal rates = high profits. Does it mean that they could afford to give your library a MUCH bigger discount - say 30 to 40 % more - and still more than cover their costs? Yes, it does. I don't have enough detail to specify the amount, but this does seem reasonable to ask. High operational gearing and cost flexibility = even though they are making way more than it costs to produce the journals, they are finding ways to cut corners and make even more profits. If they are passing on some of the savings to your library, please let me know! Products which do and will continue to benefit from technological advances and changing consumer trends = they think no matter what happens, they will just keep on making more and more money. This post is part of the economics 101 series. The Dec. 11, 2010 Dramatic Growth of Open Access has been highlighted in Katarina Lovrecic's End of the year open access highlights. Well worth a read - thanks, Katarina! Revised Dec. 17, 2010 - comment on renaissance of the scholar / publisher from Willinsky & Edgar added. 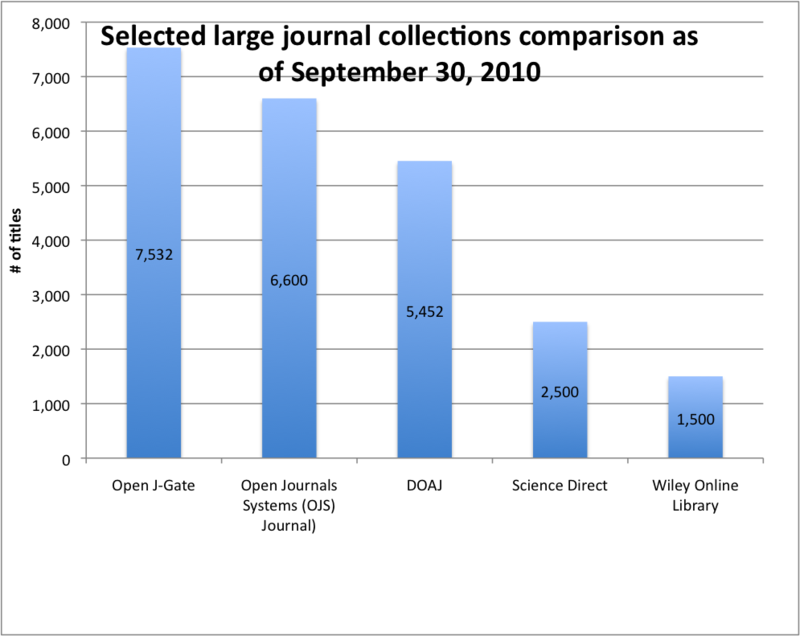 Phil Davis on the Scholarly Kitchen has posted the comment, For Open Access Journals, the Size does Matter, as a comment on my Dec. 11, 2010 early year-end edition of the Dramatic Growth of Open Access. The growth of open access is particularly amazing given how little economic support has been made available so far. The economic target that I would suggest is high-quality, fully open access publishing that is economically sustainable or cost-effective. The number of open access journal titles is an indirect indication of the growth of open access publishing per se, which would ideally be measured by the number of articles published open access. As the DOAJ search by article service grows, this measure may become more feasible over time. Nevertheless, the number of titles per se is important as an indication of OA infrastructure, that is, the ability of open access to grow rapidly, given a little support. Behind the many fairly new, relatively small journals listed in DOAJ is a substantial new publishing system which can support many more titles; and small journals with relatively few articles could easily grow with even a little redirection of funding. These are just a few of the reasons why it makes a lot of sense for libraries to join the Compact for Open Access Publishing Equity. Online-only, open access journals are not the same as print or subscription-based journals, and so it does not make sense to apply the same measures to assess the success of these journals - for example, the need to bundle a certain amount of articles for a print artefact, or to justify subscriptions has implications for the number of articles needed for a successful print and/or subscription-based journal that does not necessarily apply to an online open access journal. Willinsky & Edgar, reporting on a major survey of journals using OJS, describe the current situation as a renaissance of the scholar publisher. This is a welcome discussion of this important topic. Phil's main point seems to be that OA publishing is not yet a clear-cut success, particularly from an economic viewpoint. I would agree with this point. What is amazing to me is how much OA has grown with so little funding made available. To create further growth and to transition scholarly communication as a whole to open access, what libraries need to do is to transition funding to OA support. A good first step, one that does not require tough budgetary decisions, is simply joining the Compact on Open Access Publishing Equity - highly recommended as an OA New Year's Resolution. Phil's first question, with respect to the dramatic growth of DOAJ is: "But does this type of growth really indicate economic success in open access publishing?". My comment: there is an assumption in this question, that the purpose of open access is economic success. From my perspective, this is worth querying. Why success rather than sustainability or cost-effectiveness? What kind of success is Phil looking for? High profits? Why not fully open access, high quality publishing at sustainable or cost-effective rates? - this is what I recommend. Phil goes on to cover an article in First Monday by Frantsvåg which takes issue with the size of publishers in DOAJ, noting that most (90%) are publishers of single journals. One of Frantsvåg's key points is that small publishers lack economies of scale. From an economic perspective, I would first like to note that due to an inelastic market, mega-publishers with large portfolios of journals and fat profit margins are part of the problem, not part of the solution (a topic I deal with at length in my book, Scholarly Communication for Librarians, unfortunately not OA). Next, I would like to point out that small publishing is typical of scholarly publishers, as Raym Crow points out in his paper on Publishing Cooperatives, downloadable from the SPARC Papers and Guides website. 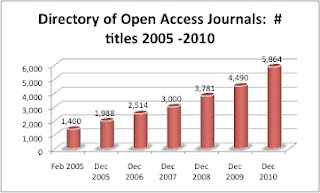 The dramatic growth of open access journals may reflect a renewal of scholarly leadership in this area. Publishing cooperatives is one of the solutions to creating economies of scale for smaller publishers. Also, with modern publishing software, such as the free, open source Open Journal Systems, it is quite feasible for a single scholarly journal to manage on its own with modest support services provided by a university library or service such as Scholarly Exchange. Another important point is that the early proliferation of many small publishing outfits likely reflects the growth in publishing support services, particularly new scholarly publishing services at university libraries. That is, behind a great many of these small publishers stands a very new publishing service representing a significant infrastructure ready to take off - just one of the reasons that I very much look forward to future editions of The Dramatic Growth of Open Access. Edgar and Willinsky describe the flourishing growth of journals using OJS (over 7,500 journals worldwide) as a renaissance of the scholar publisher, in their report of a major survey of OJS journals. published by commercial houses, compared to the 64 percent reported by Ware and Mabe (2009) and Crow (2005). Scholarly societies published 32 percent of the titles in this sample, exceeding the 23 percent that Crow found scholarly societies “self-publishing” in his study of journals as a whole (with societies having turned over 17 percent of the journals being published to commercial publishers to publish on the society’s behalf). This leaves the vast majority of the journals in this sample as published or sponsored by an academic department (51 percent), a non-profit publisher (16 percent), research unit (10 percent) and independent group (10 percent), although these percentages cannot be added up, as respondents could choose more than one sponsor (Table 2). As well, it needs to be allowed that commercially published journals would be less likely to complete such a survey, given a noted reluctance among this constituency to share information about publishing practices (Houghton et al., 2009). Still, these results suggest that the majority of these journals fall into what can be identified as the independent or scholar-publisher titles." AND "Yet this sample also stands apart from the majority of journals. Where a small number of large commercial publishers now dominate journal publishing (Crow, 2005), this study found that commercial entities formed the smallest category of publisher. The scholar-publisher – or more accurately the group-of-scholars-as-publisher – is responsible for the majority of journals in this study, constituting a type that dates back to the earliest days of the journal, when Henry Oldenburg launched the Philosophical Transactions as an independent, albeit commercial, venture. The scholarpublisher is now experiencing, this study suggests, a certain renaissance, facilitated by online, open access." Phil goes on to comment on an article by Walters forthcoming in College and Research Libraries, Characteristics of Open Access Journals in Six Subject Areas. Walters notes the wide variety in open access journals in publishers, with one journal publishing more than 2,700 articles in a year, while many others publish less than 25 articles per year. Phil seems to think that journals must be of a certain size to be successful. With electronic-only, online open access publishing, I would challenge this view. A print-based journal needs to have a certain quantity of articles for regular mailings to make sense; generally somewhat the same quantity for consistency. This is not the case with online journals at all; there is no a priori reason why an online journal needs to have a particular number of articles to be a success. One of Phil's points, that the growth of gold OA is better measured by articles than by journal titles, is something that I very much agree with (and the reason I always include the number of articles available through a DOAJ search). On the other hand, the number of journal titles is an important indication of infrastructure for OA. That is to say - if there are many OA journals that are currently publishing relatively few articles, it is highly likely that these journals could easily accomodate tremendous growth in demand for OA publishing - particularly if this transition were accompanied by a redirection of funding from subscriptions to open access. This is an indication of readiness for further growth, which is important to know! In brief: the Directory of Open Access Journals now lists 5,864 titles, having added more than 1,300 over the past year, or close to 4 titles per day (a growing growth rate!). OA is growing fast in the medical area; more than half the research funded by NIH indexed in PubMed is now freely available, regardless of publication. The number of journals actively participating in PubMedCentral is growing - now over 1,000 titles; over half provide OA to all articles, and nearly 60% provide immediate free access. Percentage-wise, OA mandates continue to lead in growth, with a total of 24 mandates added to ROARMAP this quarter, with the eprints OA Week Mandate Challenge a likely contributing factor. This fall's OA Week was the biggest ever. A unique OA milestone this quarter was Jan Szczepanski's personal OA title collection exceeding 10,000 titles. Looking forward to 2011 and beyond, clearly this is just the beginning! Suggested OA New Years' Resolutions: adopt and implement an open access mandate policy, join the Compact on Open Access Publishing Equity (COPE) or the Open Access Scholarly Publishers Association (OASPA) or both - or just keep up the good work and know that the small efforts the many thousands of us are making are adding up to all the difference in the world. Downloadable data is available at the DGOA Dataverse, or go to Google Docs to view the full data edition, or the show growth edition which highlights quarterly and annual growth. Previous editions of Dramatic Growth can be found here. # of documents in repositories: ?? Normally, I rely on totals at the meta-search engines for repositories. This quarter, Scientific Commons shows no difference from the previous quarter, while the Bielefed Academic Search Engine is down one service provide, and up less than a thousand documents. This makes no sense at all - RePEC alone added 35,000 documents. OAIster has noted an increase of 2 million documents since the last report (some time ago), up to 25 million. Does anyone know what is happening with the meta search tools? Maintenance perhaps? If so, a quick note on the website for the benefit of those of us looking at the numbers would be helpful. Open Journal Systems: 7,500 journals are using OJS. Why am I optimistic that this is just the beginning? Thanks to many conversations with librarians (and publishers) at library and academic conferences this year, I know that there are a great many activists in scholarly, library, and publishing circle, working hard to make open access happen and how to transition the system as a whole, to make it easier to make OA happen. Because of my work co-coordinating the ARL ACRL Institute on Scholarly Communication webinar series this year, I know that there are many people in libraries across North America that have already developed significant expertise in this area, others are working to get up to speed, and many libraries are in the process of moving from a step-by-step to a comprehensive programming approach to open access. Noteworthy in October: Open Access Week extends its reach with broader participation than ever before, as noted by SPARC's Heather Joseph and Jennifer McLennan, with one of the results being the most prolific month ever (to date) for open access mandates as recorded by Peter Suber in the November 2010 SPARC Open Access Newsletter. Results of the Open Access Week Mandate Challenge, thanks to Les Carr on OASIS: During the Challenge, 14 new mandates were adopted. Of these, 7 wereinstitutional, 3 were departmental and 3 were mandates on theses. In addition, one was a multi-institutional mandate, the first ever, covering the 29 research institutes of the EUR-OCEANS consortium. The next full edition of Dramatic Growth is the early year-end edition, to be released by mid-December. If your OA initiative reaches an important milestone, don't hesitate to drop me a line. The growth rate of open access is robust and growing. DOAJ added 312 titles this quarter (more than 3 per day), for a total of 5,452. There are now more than 6,600 journals using OJS. The number of journals fully participating in PMC continues to grow, while the NIH Public Access Policy compliance rate is about 60%, indicating significant progress but still room for improvement. BASE now searches more than 25 million documents. Hindawi's monthly submissions have grown to over 2,000 this quarter. The dare to compare section below asks the evocative question of whether the open access sector is, or soon will be, ready for serious comparison with the subscription sector. There are at least four major free or open access journal collections that are more than twice the size of the largest commercial publisher, Elsevier, in terms of number of titles. For example, DOAJ, with over 5,000 titles, has more than twice as many titles than Elsevier. While there is some comparison of apples and oranges here, one conclusion seems reasonable - open access publishing is already comparable to subscription publishing, in terms of capacity if not yet by size. There are also at least two open access metasearch services that may rival, in size, Science Direct. Again, too early for conclusions, but enough to suggest that serious research may be warranted in the not too distant future. Full data are available for download or viewing. Previous editions are available. The following figures are deliberately intended to be evocative, if not provocative. It is acknowledged that there is some comparison of apples and oranges here. The key point is that there are an awful lot of open access apples - or oranges, as you prefer - enough so that comparisons with the subscription based sector either are, or soon will, be worthy of serious research. There are at least 4 large collections of free and/or open access scholarly journals that are more than double the size of the world's largest scholarly publisher, Elsevier, by number of titles. Even when we limit to peer-reviewed collections alone, DOAJ now includes more than twice the number of titles in Science Direct. The chart above shows just a few of these large collections for comparison purposes. Electronic Journals Library, with over 26,000 titles, has been omitted from the chart to better illustrate the differences in size of the collections included. This does not mean that open access publishing exceeds subscription-based publishing at this time. However, it is reasonable to draw the conclusion that the capacity of the open access sector already rivals that of the subscription-based sector. 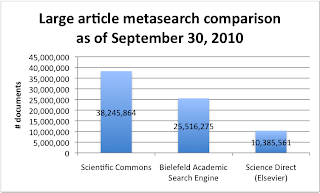 Similarly, there are at least two major metasearch services, Scientific Commons and the Bielefeld Academic Search Engine (BASE), where searches encompass more than twice the number of documents available through Elsevier's Science Direct. While it is not possible to draw any conclusions about the relative number of articles available from each search (both BASE and Scientific Commons will draw on many more types of items than just articles, and duplication due to multiple deposits is likely), it is reasonable to conclude that the relative amount of articles available open access and through major publishers either is, or soon will be, worthy of comparison through serious research. 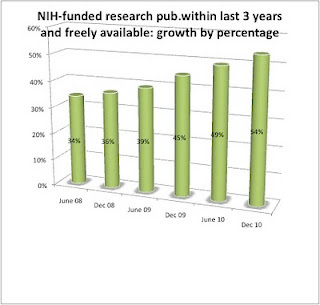 The NIH Public Access policy compliance rate of 60%, not too far different from the 44% compliance rate reported by Robert Kiley of the Wellcome Trust for their policy earlier this year, is both a sign of progress and an indication that there is still a great deal of work to do to make works publicly or openly accessible, even with these strong mandates. The continuing strong growth of open access both overall and in the PubMed context, as illustrated by the growing list of journals participating fully in PMC far beyond the mandates, contrasts with this lagging compliance rate, and suggests ongoing polarization within the publishing community. Growth rates are calculated on the basis of growth over the past year divided by the relevant time-metric (365 for daily, 12 for monthly, 52 for weekly), and rounded. Update October 5, 2010: the currency reported in the STM report was USD, not UK pounds sterling. Thanks to Mark Ware, author of the STM report, for this information - and interesting example of open peer review in action! The USD currency is reflected in the STM report v1.1 on the STM website. What this means is that my original figure (based on an assumption of US currency) of 64% savings is more accurate. I will rework the spreadsheet and re-release in the near future. Additional open peer review is welcome. At the PLoS average article processing fee of $1,649 U.S. per article, or BMC average article processing charge of $1,560 U.S., libraries worldwide could fund full open access to the world's estimated 1.5 million scholarly peer-reviewed journal articles produced every year at less than 30% of current annual global academic library journal expenditures. The purpose of this broad-brush, macroeconomic analysis is to sweep aside the complexities of transitioning to open access, to view just how achievable open access is from an economic standpoint. Take the total STM annual journal revenue as reported by Mark Ware for STM of 8 billion pounds sterling and convert to about 12.6 billion U.S. Calculate the ratio and voila! 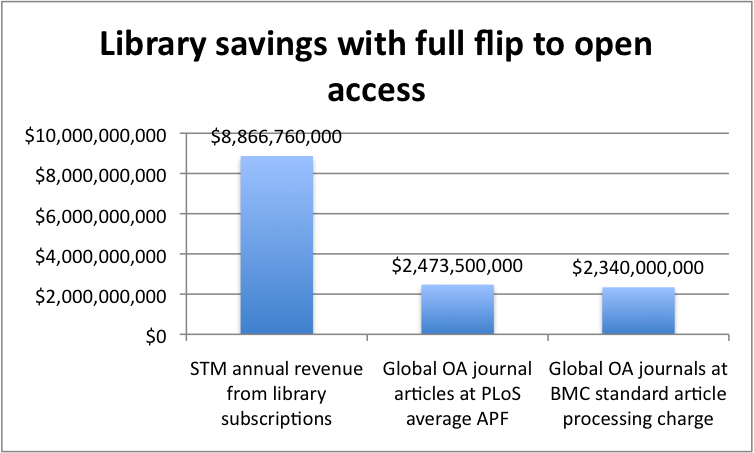 Libraries CAN have our cake and eat it too - full open access with cost savings. One key point: the average cost per article matters. To keep things simple, this macroanalysis only considers one business model for open access, and only two publishers. BioMedCentral standard article processing charge - from BMC website http://www.biomedcentral.com/info/authors/apcfaq Sept. 27, 2010. Björk, Bo-Christer; Roosr, Annikki; Lauri, Mari. (2008). Global annual volume of peer reviewed scholarly articles and the share available via different open access options. ELPUB2008. Open Scholarship: Authority, Community, and Sustainability in the Age of Web 2.0 - Proceedings of the 12th International Conference on Electronic Publishing held in Toronto, Canada 25-27 June 2008 / Edited by: Leslie Chan and Susanna Mornati. To download a spreadsheet with calculations, go to the Economics of Scholarly Communication Dataverse. This post is part of the Transitioning to Open Access and Economics 101 series, and is an update and correction of a post from 2009. Wiley open access moves: scholarly societies pushing for OA? Wiley just announced the hiring of a Senior Open Access Marketing Manager. Wiley-Blackwell supports any business model that is financially sustainable and scalable, and is able to maintain quality and the stewardship of the authoritative version of record. Together with a number of our society partners, we are experimenting with alternative models. In addition, several of our journals offer free access to older content and to certain types of material, such as review articles." Comment: way to go, scholarly societies!!! Note that scholarly societies could likely go for full open access at much lower rates for article processing fees on their own. With full OA, dissemination is as simple as registering with DOAJ and making the journal web-accessible. These are established journals which are already well-indexed, a factor that would not be impacted with the switch to OA. Editors should check with their local libraries, as many have free or very low cost journal hosting services. It is probably more than worthwhile to check rates with other OA publishers, such as CO-ACTION publishing, BioMedCentral, and Hindawi. Almost half (47%) of Wiley's journal revenue financial report (detailed report - downloadable from http://www.wiley.com/legacy/annual_reports/ar_2010/index.html), p. 13. What the institutional repository does with respect to download counts, is to direct traffic to the university's site. This will increase the university's web presence and hence emerging institutional web impact assessments, likely to be of increasing importance in years to come. Having said that, I would also like to point out that there are serious dangers to scholarship that come with over-emphasis on the numbers. What is popular from a scholarly perspective at one point in time is not necessarily what is important. One way to think of this: imagine that we humans are like a group of lemmings rushing madly towards a cliff (given the climate crisis and our limited attention to this, I would argue that this is a reasonable comparison). Any lemming that says (or writes) about - how to get to the cliff even faster - is likely to be well-heeded (and cited, if it is an academic lemming). On the other hand, the scholar who looks ahead and sees the cliff and shouts off (or writes up for a peer-reviewed lemming paper): "Hey! Cliff ahead! Should be change direction? " may not get much attention immediately. (Later on, after the early birds have gone over the cliff, could be a different story). Another important point: one real danger of usage statistics is the potential for usage-based pricing. If we go this route, it is just a matter of time before some of us impose limits on reading. If the undergraduate research project becomes a cost item, there will be a strong incentive to limit research and/or eliminate research projects. When one copy of an article can easily serve anyone, anywhere, it would be a shame to go this route. (Thanks to Andrew Odlyzko for pointing to this danger). Comment: if there is one single possibility that tipped the balance for me to become an open access advocate, it is the spectre of usage-based pricing and the evil that this entails, at least for scholarship. Update August 23: http://www.emusic.com/ has been suggested. Interesting - DRM-free music, but on the other hand an ongoing monthly financial commitment, which I don't like, with emusic reserving the right to change the terms and conditions at any time. Not sure about this, but definitely much better than itunes. Much as I like the idea of the convenience of buying music online (whether for download or CDs), I can't bring myself to sign the itunes agreement. This agreement says that I can only use what I buy in Canada, and apple reserves the right to use spy technology to enforce this. Nor am I keen on purchasing through Amazon, since I don't see an easy way to filter out music produced by companies that employ evil sue-their-customers-even-kids techniques and/or who advocate for evil copyright protection. Perhaps an Amazon "no-RIAA members" button would suffice? Given the popularity of the international Pirate Parties, maybe it's not just me? On the other hand, maybe I should just create my own music. Best excuse for procastinating I've come up with in a long time: what do you mean, this won't be open access? Suitable for authors of all toll access publishers. Many librarians have never studied economics. Now that we are playing a key role in transforming scholarly communication, we need to know a little about the topic, at least as it applies to the stuff we work with. This is true whether we're in library management, collections, or at the front lines working with faculty on scholarly communication issues. This post is the first in a series designed to provide an easy reading introduction to librarians on this topic and for this purpose, called Economics 101. Today's topic introduces the concept of the worlds of differences that exist between publishers. I will be using one of my favorite examples - since it is both so extreme, and from LIS. Emerald's Library Management, with a subscription price of Euro 11819 according to Ulrich's (that's 15,138 USD by today's conversion rate), costs about 190 times as much as ACRL's College and Research Libraries (similar in number of peer-reviewed articles per year), at a maximum non-member non-US rate of 80 USD. While this is an extreme example, it nonetheless illustrates an important point: the journals of the for-profit commercial sector can cost not only more than the not-for-profits, the commercials often cost a very great deal more. This is important, because if we would like to see a healthy, affordable future for scholarly communication, we need to understand and support the often small, not-for-profit publishers, whether they are our own, as in the case of C&RL, or help our faculty members to see the importance of supporting such journals in their own disciplines. When it comes time for renewal, budgets are tight, and of course we want publishers to keep their prices down. But does it make sense to ask the same sacrifices of a publisher of a journal that costs only $80 and another very similar journal that costs more than $15,000? If we thought about the important work that ACRL does and how low that $80 subscription ($70 in the U.S., by the way) is, and asked ACRL to double the price for C&RL, and negotiated with Emerald for a 1% decrease in the cost for Library Management, we would save money (1% of $15,000 is $150 - $80 for doubling the cost of C&RL). We would save $70. Or, why not ask Emerald to be just a bit more reasonable, and halve the price of Library Management to just $7,500 U.S.? This would save us enough money to pay for subscriptions to 94 journals like C&RL. The irony is, that when we explain the dire straights of library budgets to publishers, it is the ACRLs of this world who are the first to step up and assure us that they will keep prices flat. A simple way to keep this difference in mind in the field: when comparing journals or publishers and their pricing changes over the years, keep in mind the actual price - not just the percentage of increase or decrease. A 1% increase to C&RL is $.80; a 1% increase to Library Management is $150, almost double the full subscription cost of C&RL. This post is the first in the series Economics 101. While the examples here are subscription-based journals, overall the purpose of understanding the economics is transitioning to open access. What's the connection? Publishers that have never gouged anyone, but have rather always kept their prices reasonable, often (like C&RL) have a well-deserved reputation for high quality. If they depend on library subscription dollars - let's help them to make the transition to open access. When I talk to people involved with many of these journals, what I hear is that many of them would love to make such a transition - they just need a little help, and if librarians step up to help them, many would welcome the help. Striphas analyzes the relative costs of journals from different publishers in cultural studies, and finds that the journals produced by commercial publishers cost from 50% to 1000% more (10 times the cost) than the not-for-profit university press journals, with the average price at Sage the highest at $853. Striphas' analysis on why addresses added value to the publisher databases (bells and whistles for searching), but notes that the main reason is because publishers can charge this much, because of the inelastic market. The section on alienation in this article is useful for those working on author's rights. Citation: Striphas, T. (2010). Acknowledged goods: Cultural studies and the politics of academic journal publishing. Communication and Critical/Cultural Studies, 7(1), 3. The webcast of my keynote speech at the LIBER 2010 Conference, The role of the research library in an emerging public sphere, is now available. As librarians across the country know, it is not easy for searchers to find information about Canada. Recently, in a discussion about the Canadian Census, someone pointed out how much more open and useful the U.S. Census data is. Have a look - it is impressive indeed. The point was, that this Canadian admitted to doing research using U.S. Census data rather than Canadian data for their grad thesis, just because it was too hard to find Canadian data. A story that reference librarians are all too familiar with. Update August 7: Allison Martell explains why she used American census data rather than Canadian for her undergraduate project, because the Canadian data were not usable. When American information is easy to find, and Canadian information almost impossible to find, what ends up happening is that Canadian researchers end up helping Americans with their problems, even if they want to help us with ours. If Americans thought about this and wanted to reciprocate, they'd have a hard time finding our information and probably give up. The U.S. already has a strong mandatory open access law with the National Institutes of Health, and discussions are well underway to extend this to all U.S. federal funding agencies. Canada had better get going on our own OA mandates and make our work visible, quick, or we'll end up becoming even more marginalized from a knowledge standpoint. This anecdotal view is a good fit with the author impact advantage illustrated in Steve Hitchcock's excellent bibliography of studies on this topic. Canadians who are advocating for the return of the mandatory long form of the census: why not add to the list of the demands that the data be made just as open and usable as the U.S. Census data is? If we don't need to read the research results for a while - why not redirect the research funding? One of the more puzzling arguments made by publishers lobbying against open access is the notion that in some areas, there is a long lag between publication and reading, so a lengthy embargo of multiple years is needed. If this is the case, it seems obvious to me that if there are other areas - such as keeping up with the latest in my own field of communication, advancing medical research, or finding environmentally sustainable energy solutions - where the needs are more urgent, instead of protecting the publishers of the less-pressing research, why not redirect the research funding? Not that I am advocating such a step be taken - but doesn't it seem logical? Addition August 1st: this argument is a part of a larger argument, that is, if there is no compelling public interest in viewing the results of publicly funded research - then why is the public funding the research in the first place? American Psychological Association claims to pay for peer review. Should we send them a bill? According to this nextgov article, Steven Breckler, executive director for science at the American Psychological Association, says, "One of the major concerns publishers raised is federal funds do not cover the costs of peer review, which is a service the APA journal provides to readers by coordinating a panel of experts to vet a prospective author's research before publishing it". The reality: publishers do not pay for peer review; this is provided on a voluntary basis by the academic community itself. This is an argument that keeps coming up over and over again, and I am wondering how to get the point across that it is foolish to claim to pay for valuable services that you are getting for free? In today's fiscal environment, universities everywhere and certainly universities in the U.S., are dealing with some very tough budget situations. If publishers are claiming to pay for peer review, hey, why not send them a bill? The dinosaurs roar, or, does the U.S. need an Outmoded Lab Equipment law? The publishing dinosaurs, predictably, are predicting that dire things will happen if the U.S. enacts strong public access legislation. The simple fact is that in the day of the Internet, open access publication is a very great deal more efficient and effective than what was possible with print. One online copy is readily available to anyone, anywhere; plus with full libre open access, allowing for re-use, it is possible to use data mining techniques to much more rapidly advance research. If the arguments that publishers have invested in this system make sense, here is a thought: why doesn't the U.S. enact a law protecting manufacturers of outmoded lab equipment? These people have invested in technology, products, and services, and every time a better technology comes along, they need to come up with new and better technology, or go the way of the dinosaurs. If the arguments of the publishing community make sense, so do this. The text and powerpoint of my keynote at the 39th annual LIBER (Association of European Research Libraries) Conference is now available. Presents a vision of a potential future global public sphere, why it is needed and signs of emergence, and the role of the research library in this global public sphere, as provider of a distributed knowledge commons, preserver of scholarly information, and source of specialized expertise. Key short-term transitional steps are covered, particularly transition to a fully open access scholarly publishing system. Note: I'll post a link to the webcast once this is available. Observed in a completely non-scientific way in my last foray into the heart of the City of Vancouver: construction work underway on 3 sizable housing projects targeted to people in need of support as well as housing. Kudos to the Province of BC and the City of Vancouver for this work, especially during tough fiscal times. Those of us who advocate for the public good should try to remember to notice and say thank you when our politicians are doing things right, not just critique when they aren't. It is not likely that these few projects will solve the problems of homelessness or lack of support for the mentally ill in Canada, but they are a step in the right direction. If this is what my tax dollars are going to support, that's a good thing, and I for one would like to see more along these lines. The International Association of Scientific, Technical and Medical Publishers, or STM - the body that represents primarily the highly profitable sector of scholarly publishing - has issued the "STM submission on “Recommendations for implementation of Open Access in Denmark”. Following are some comments on this submission. In brief: STM makes a case for a EU benefiting from balance of trade. Denmark may wish to consider whether it is a supplier to other countries of this balance, and whether this situation risks loss of Danish-funded research. This is the situation for the vast majority of countries in the world. STM greatly overstates their contributions to scholarly publishing, for example claiming to "underwrite the creation" of scientific information. This is patent nonsense; for a publicly funded research article, it is the public funder, university and scholarly researcher / author who create the information. STM claims to have taken on the role of preservation; it would be bizarre indeed for the private sector to take on this role. STM bases their economic case on the high cost of moving to the online environment in the 1990's. Any industry that has not noticed the tremendous decrease in costs of information technology in the last two decades is rather obviously out of touch. Speaking of out of touch, STM claims to have been involved with scholarly publishing for 350 years. In reality, almost all scholarly publishing was in the hands of the not-for-profit sector until after the second world war, and today, the open access publishing community, not at all mentioned in this letter, is sizable and growing, with over 5,000 fully open access, peer-reviewed scholarly journals listed in DOAJ, which is growing by more than 2 titles per day. STM makes a "Euro 3 billion contribution to the EU’s balance of trade". While I cannot comment on the overall balance of trade, I would suggest it worthwhile for Denmark to consider the Denmark-specific situation. The number of very large, highly profitable STM publishers in the world is very small, and I don't think any of them are centered in Denmark - which makes it highly likely that Denmark, like the vast majorities of countries in the world, is on the supply side of this balance of trade, i.e. like Canada, in Denmark the cash flow is likely very much from Denmark outwards. Another similarity is that Denmark, like Canada, in giving away the results of Danish-funded research to highly profitable publishers in other countries, risks losing access to the results of the research that it has funded, should Denmark be in a position to not be able to afford the pricey packages of these publishers. improvement, dissemination, preservation and use of scientific information. It is misleading to include the efforts of private sector organizations in this response; a government mandate for government-funded research will obviously not include privately funded research. Also, STM is greatly exaggerating the role of the publisher. STM does not "underwrite the creation" of scientific information, for example. With publicly funded research, it is the public funder, the university, and the scholarly author(s) who create the information. It is voluntary peer-reviewers and often semi-voluntary editors who are responsible for peer review (registration and certification). Preservation: it makes no sense to ask the private sector to take on the role of long-term preservation. Any private organization has a right to change its focus of operation, or cease to exist, at any time. The role of preservation should be undertaken by the public sector; this has long been the role of libraries, and should continue to be so. Consider how ludicrous it would be to mandate that private publishers undertake the role of preservation - a policy that would say something like, "if you undertake to publish scholarly information, it shall be thy responsibility to maintain it, for all eternity!" Now THAT would be an unfunded and unsustainable mandate, wouldn't it? "STM publishers support the maximum sustainable dissemination of the published record of science and for 350 years we have helped create, disseminate and (now) preserve the world’s body of knowledge". The commercial sector in scholarly publishing emerged after the Second World War. Up until this point in time, scholarly publishing was conducted almost exclusively by not-for-profit scholarly publishers, and the not-for-profit sector continues to produce a very large portion of scholarly publishing. Far from supporting the maximum sustainable dissemination of the published record of science, STM has taken advantage of an inelastic market to consistently raise prices above inflationary levels, creating a serials crisis. Today over 2,000 scientific and scholarly publishers worldwide (including large and small commercial, university presses and learned societies) manage and fund the processing of some 2-3 million manuscripts submitted from researchers and finally produce annually in excess of 1.5 million peer-reviewed published journal articles in some 25,000 journals. STM neglects to mention that today, a large and growing share of these publishers are either fully open access publishers (the vetted Directory of Open Access Journals now lists more than 5,000 fully open access, peer-reviewed scholarly journals, and is adding titles at the rate of more than 2 per day), or publishers who provide open access after a temporary embargo period (often 6 months to a year) on a voluntary basis. A majority of publishers allow for author self-archiving, as listed on the SHERPA RomEO Publisher Copyright Policies and Self-Archiving site. In other words, the number of publishers who would have to change current policies and practices to conform to a public open access policy mandate is small, and shrinking. On the funding: it would be more accurate to say that the highly profitable publishers are FUNDED BY the system, rather than that they fund it. It is understandable if their view is different, however, scholarly publishing is different from a typical business, as it is the scholars themselves who are the largest group by far of readers as well as authors. It is more accurate to say that libraries, acting of behalf of their scholar reader/authors, who fund the system, indirectly through publishers. Since the early 1990s, STM publishers have invested heavily in the migration from print based products into electronic, digital versions, with the result that 96% of scientific, technical and medical journals1 and 87% journals in arts, humanities and social sciences are available electronically, fully searchable, and accessible on the world wide web. In the early 1990's, it was indeed expensive to move into the online environment. However, technology has evolved, as has publishing software, and the costs of computing have decreased - very dramatically so. Nowadays, using freely available open source software such as Open Journal Systems, the technology requirements of scholarly publishing are a very great deal less than was the case in the 1990's. It makes no sense at all to base the economic present and future on the basis of one time-limited expense. For more background, please see my book, Scholarly Communication for Librarians. Links to two open access chapters can be found from the main page of my blog. Requests for clarification about any of the details of this post are most welcome. The deadline for Canada's Digital Economy Consultation has been extended to July 13. Please take a few moments to register and vote for open access policy for Canadian funded research (under Canada's Digital Content in the Ideas Forum), and many other fine Ideas such as open data, net neutrality, and support for the Community Access Program. The July 9 updated version of the open access submission (with added names) has been submitted today. Kudos to the Canadian Heart & Stroke Foundation on their OA mandate! Peter Suber just released the July 2010 SPARC Open Access Newsletter. Featured this month: California vs. Nature. The June 30, 2010 issue of The Dramatic Growth of Open Access is now available for viewing or open data download. Open access policy continues to be the headline growth story, particularly institutional OA mandates and total OA mandates, both of which have more than doubled over the past year. There are now a total of 220 mandates. DOAJ is now over 5,000 journals - congratulations, DOAJ!! By my calculations, this means that about 20% of the world's peer-reviewed journals are now open access*. DOAJ title growth was particularly strong this quarter, 277 titles or an average of 3 titles per day (over the past year, 888 titles added, over 2 titles per day). In addition to title growth, DOAJ is showing growth in the number of titles and articles searchable at article level - the latter is now over 400,000. BASE added about 1.5 million documents this quarter, or about half a million documents per month. As reported by Bjork et al in PLoS One, about 1 in 5 articles published in 2009 are now freely available. This is a brief version of DGOA so that I can get back to the LIBER 2010 Conference in beautiful Aarhus, Denmark as quickly as possible. For more, please see my Dramatic Growth of Open Access Series, where I often include links to highlights to other milestones and indicators of growth. * Note that both traditional measures of peer-reviewed journals and OA counts are missing important data, such as numbers of journals from China. I would appreciate hearing from anyone who has ideas on how to address this. Preliminary results of the Open Access Journals Support in Canada research project, as presented by myself and Brian Owen on behalf of research team members including Donald Taylor, Andrew Waller, and Kumiko Vezina at the June 1, 2010 Canadian Association of Learned Journals (CALJ) Annual General Meeting, part of the Congress conference, are now available in the SFU D-Space and E-LIS. Describes preliminary results of the pan-Canadian Open Access Journals Support in Canada survey of university libraries and presses conducted in spring 2010. The majority of respondents are involved in scholarly journal publishing, with more planning to get involved. There is strong trend towards preferential support for open access publishing. Responses to questions about support for a variety of open access models indicated that any model for OA transition would received some level of support from a majority of libraries. Libraries and librarians are continuing to cope with the impact of the global financial crisis, and I understand that some of us are beginning to wonder why our libraries are facing deep budget cuts and staff furloughs while a few of the largest commercial publishers are boasting record profits. Understandable, some are beginning to look for a better deal, and personally I think this is a very good thing. However, this might be a good time to highlight that there is a very wide discrepancy in the cost-effectiveness of different types of publishers. It it not fair, IMHO, to treat the mission-oriented publisher that has never charged more than they needed to survive, as if they were the same as the highly for-profit publishers. By all means, let's look for deals - but let's not forget that a 3% increase to a $100 subscription is only $3, while a 3% increase to a $1 million subscription is $30,000 - and the $3 increase might mean the difference to survival for the efficient publisher, while the for-profit would have to give up more than $30,000 to even begin to have something resembling a revenue cut of a much smaller order of magnitude than what is faced by many a library. As of today, the subscription list price for the for-profit Library Management (Emerald) is EUR 11,819 (Ulrich's). That's $14,600 US (Bank of Canada currency conversion service, June 18, 2010). Compare this with the MAXIMUM institutional cost for ACRL's College and Research Libraries at $80 US for non-member institutions outside of the US and Canada. This is a difference of well over a hundred fold in subscription cost for these two journals, and I would argue that of the two, it is ACRL's College and Research Libraries that is the more prestigious. I do acknowledge that single subscription costs are of limited applicability in the world of bundled and largely consortial pricing. Also, this is an extreme example. Cost differentials in the range of 4 to 10-fold appear to be much more common (that is, the cost of one journal on a per-article basis can be a four to 10 times as much for another journal of similar or every higher quality. Imperfect though this example is, it is illustrative of the wide difference in costs between different publishers which does not necessarily correlate in a positive manner with quality. The original analysis for this example is from my book, Scholarly Communication for Librarians, Chandos Publishing: Oxford, 2009. The cost differential has increased since the time the book was written; the ACRL cost is stable, while the Emerald cost has risen considerably. [Disclosure: I am co-coordinator of the ARL and ACRL Scholarly Communication Institute webinar series, Building Strength through Collaboration, however this has nothing to do with ACRL publications or membership]. Emerald (formerly MCB) has received its fair share of criticism in the past (including some from me, back in those days of the newsletter of serials pricing issues), but I've learned since then, that Emerald is an extreme example of pricing policies that appear to address the bold and adventurous among us, those that have no fear to apply all the techniques learned on the bazaar, rather than the timid, who ask for the list price and turn pale in horror. To put it simple and bluntly, if you actually have a few Emerald titles in your collection that you pay at list price instead of a bundle, you or your predecessors in your job probably made a terrible mistake, or your institution has/had too much money to spend. Just cancel and start anew. Essentially, you buy Emerald as a full text database (various sizes and collections available) and have to judge its efficiency on that basis (i.e. on an aggregated cost per use base), not any individual titles a la carte which would be terribly expensive. I'd also question your placative and simplistic contrasting of the (efficient) "mission-oriented publisher that has never charged more than they needed to survive" with the (inefficient) "highly for-profit publishers". That's a poetic notion not one that adequately matches today's complex business realities for scholarly publishers, both for-profit and not-for-profit. This is very helpful information, thank you Bernd-Christoph. I should clarify that I do not mean to paint Emerald as a "bad guy" at all; in fact, Emerald has a very enlightened approach to green OA self-archiving policies. Nevertheless, I think that this fantasy price model - which I suspect is not unique to Emerald - bears further investigation. I plan to mull this over a little. On the other hand, ACRL and College and Research Libraries, producing top quality scholarly publishing at rock-bottom prices and making good efforts towards open access by supporting author self-archiving, and making many articles fully open access, is, in my mind, a clear-cut good guy. This post is part of the Transitioning to Open Access series. From my perspective, a healthy open access future for scholarly communication should be built on sustainable business models. Update July 4: for commentary on the fantasy pricing model, see Barbara Fister at Library Journal. On behalf of a group of Canadian and international open access advocates, I have just contributed a submission to Canada's Digital Economy Consultation. It may be a few days before this appears on the government web site. The text of the submission can be viewed here. Update June 19: the submission is now available on the Industry Canada site. We recommend that Canada develop a policy requiring open access to federally funded Canadian scholarship, i.e. research funded by the research granting councils CIHR, SSHRC, NSERC, and NRC. This policy would ensure taxpayer access to taxpayer-funded research, maximum impact of taxpayer-funded research, bring Canadian policy into line with international policy developments, and appropriately secure a place for Canada as a leader in this important area of innovation. The policy needed is for researchers funded by federal granting agencies to be required to deposit, in their institution’s open access repository, a copy of the author’s final manuscript of all published peer-reviewed articles arising from federally funded research, immediately on acceptance for publication, with access to the deposit set as open access immediately, or after a minimum delay to accommodate publishers. The locus of deposit should be an appropriate open access repository; by default, the author’s institutional repository. Cross-deposits from institutional to central repositories (such as PubMedCentral Canada, as mandated by CIHR) can then be done automatically by software. In 2008, CIHR adopted a Policy on Access to Research Outputs, which is in many ways an exemplary policy, although there is a loophole to be addressed, as it allows for opt-out based on publisher copyright policies. This is neither justified nor necessary. While the contributions of professional publishers are very valuable, the published article reflects the contributions of many parties, including the Canadian taxpayer, the authors, their institutions, the voluntary peer reviewers, and often human subjects as well. No one contributor to the process should have exclusive rights to the final report; an open access requirement is reasonable and fair to all. In addition, researchers should be encouraged to do the same with their research data (while ensuring that confidentiality / anonymity of research subjects is maintained), as well as with other works, such as monographs and creative works, wherever possible. The simple no-cost step of requiring open access deposit would have tremendous impact in advancing the effectiveness and dissemination of Canadian research. Update June 16: if you would like to add your (or your organization's) name, please let me know at hgmorris at sfu dot ca, and I will submit a revised version on July 9. Update June 15, 2010: Oxford University Press has issued a revised press release, which clarifies that the spin is indeed coming from OUP. Through the Oxford Open initiative, launched in July 2005, Oxford University Press (OUP) has experimented with open access models and has been carefully monitoring and sharing results. Today, six Oxford journals are fully open access and over 90 are hybrid open access, where authors of accepted papers are given the option of paying an open access publication charge to make their paper freely available online immediately. In 2009 the average uptake of the open access option for participating journals fell to 5.9%, compared with 6.7% in 2008. This reduction was due to a lower uptake amongst 11 new titles joining Oxford Open in 2009. On a like-for-like basis, the average uptake in 2009 for journals which entered the scheme prior to 2008 was stable (6.7%, compared with 6.8% in 2008). From 2005 to 2010, based on this information, OUP has transitioned from a fully subscription model to a point where 6 OUP journals are fully open access, and 90 are hybrid open access. The Oxford Open option greatly understates open access, as it does not take into account author self-archiving, as explained in detail by Stevan Harnad at Open Access Archivangelism. From this press release, it appears that journals that have been participating for some time have a stable participation rate. OUP could be reporting open access success, but has chosen to focus on the negative. In addition to what is obviously some success in moving towards OA at OUP, supplemented by author self-archiving, another factor to take into account is that authors desiring full open access might be choosing different journals. OUP charges article processing fees, while the vast majority of OA journals do not use this business model. Of the journals that do charge APFs, OUP may not be competitive on a cost per quality basis. Then, too, libraries that are supporting OA via APFs are often refusing to support hybrid journals. I am not sure why OUP has chosen to focus on the negative. Their academic library customers are eager for change, and it appears that OUP is in a great position to take advantage of this desire. Why not market OUP as an alternative OA solution? Academics remain reluctant to allow their journal articles to be deposited in open-access repositories, according to the Oxford University Press. The press announced Thursday that the percentage of Oxford Press articles authorized for re-publication in its open-access repository decreased overall from 6.7 to 5.9 percent between 2008 and 2009. Officials attributed the decrease to a relatively low rate of opt-ins from 11 new journals to which the option was extended in 2009; putting those new titles aside, the proportion of authors allowing their work to be made freely available stayed roughly the same. Still, the stagnation of that rate indicates that researchers are still wary of endorsing an open-access model, Oxford officials said in a release. Humanities scholars were the least willing to participate in Oxford Open, the press's open-access initiative, opting in at a rate of 2.5 percent. Life sciences scholars were the most generous with their work, with 11.4 percent allowing their papers to be freely accessible. Why the spin? According to this information, OUP has a stable rate of participation in Oxford Open for journals that have been participating for a while, and a lower rate of participation for journals that have just joined the program - hardly surprising, as the journals that were most keen to participate were likely part of the original group. Why add the numbers and spin this as if it were decreasing participation? If a statement like this were made in an article submitted to a journal for peer review, any journal worth its salt would refuse to publish the article unless the statement were revised. Note that I cannot find any such press release on the Oxford University Press site. My comment on the Inside Higher Ed site requests the original release to which this Quick Take is referring. The latest open access controversy: are we in the age of open access, or just on the verge? Debate in scholarship is a healthy sign - and this new debate amongst open access advocates, as recently emerged in the national meeting of Canada's Federation of Social Sciences and Humanities, is most welcome! It seems that there is a divergence of opinion amongst open access advocates, as to whether we are already in the age of open access, or just on the verge. I must admit to being on the fence on this debate myself; while the momentum of the OA movement does seem to be unstoppable at the moment, it is, from my perspective, prudent for OA activists to continue full steam - not to mention fun to be at the crest of such a successful movement! Other aspects of recent debates are also very welcome; the days of questioning whether or not OA is a good thing are long past, with the current focus being very appropriately best practices for OA implementation. Enabling Open Scholarship has just released David Prosser's Open Access Policies in Europe. This succinct overview by one of open access' most noteworthy champions is a must-read for anyone involved in OA policy development or advocacy. Recently in the Liblicense list, the idea came up that publishers could simply refuse to publish works by authors covered by open access policies. Of course, this is their right! Publishers who share such view might wish to get together and form a new association, to plan their futures together. Here is my suggestion for a title for the association: The Journals for Strictly Limited Dissemination of the Works of Unfunded and Unemployed Researchers. Since this title is rather long, I suspect the abbreviation The Journals of Unfunded Research could quickly become popular. The membership list of this association could be most helpful to librarians, in these difficult financial times when we need really good information about what to cut. And frankly, if journals are refusing articles written by the likes of authors at Harvard, MIT, as well as a large and growing list of other institutions, or funded by a growing list of the world's major research funders - it seems reasonable to ask what exactly they will be publishing in the near to medium term future. For a list of the 220 open access mandate policies to date, see ROARMAP. Indian open access advocate Subbiah Arunachalam (Arun) has sent a letter to the Consultative Group on International Agricultural Research (CGIAR) urging that CGIAR require open access to CGIAR-funded research. About a year ago, on 20 May 2009 to be precise, Dr William D Dar, Director General of ICRISAT sent a Memorandum on Launching of Open Access Model: Digital Access to ICRISAT Scientific Publications to all researchers and students in all locations of ICRISAT [http://openaccess.icrisat.org/MemoOnDAIS.pdf]. In the memorandum Dr Dar had said "Every ICRISAT scientist/author in all locations, laboratories and offices will send a PDF copy of the author's final version of a paper immediately upon receipt of communication from the publisher about its acceptance. This is not the final published version that certain journals provide post-print, but normally the version that is submitted following all reviews and just prior to the page proof." ICRISAT is the only international agricultural research centre with an OA mandate, and is second among the research and education institutes operating from India, the first being the National Institute of Technology-Rourkela (http://dspace.nitrkl.ac.in/dspace/). ICRISAT publishes a research journal (http://www.icrisat.org/journal/) which is also an open access journal. Since then is growing fast and the portal now has virtually all the research papers published in recent times, and all the books and learning material produced by ICRISAT researchers. We believe that it would be great if other CGIAR laboratories could also mandate open access to their research publications. Indeed, it would be a good idea to have a system wide Open Access mandate for CGIAR and to have interoperable OA repositories in each CGIAR laboratory. Such a development would provide a high level of visibility for the work of CGIAR and greatly advance agricultural research. Besides, journals published by CGIAR labs could also be made OA. There are more than 1,500 OA repositories (listed in ROAR and OpenDOAR) and about 5,000 journals in the Directory of Open Access Journals (DOAJ). Currently over 2050 journals are searchable at article level. Over 390,000 articles are included in the DOAJ service. The world will soon be celebrating the International Open Access Week [18-24 October 2010] and you may wish to announce the CGIAR OA mandate before then. As you may be aware, all seven Research Councils of the UK and the National Institutes of Health, USA, have such a mandate in place for research they fund and support. To see the full list of ~220 mandates worldwide, see ROARMAP. We look forward to seeing an early implementation of open access in all CGIAR labs. Comment: bravo to Arun, our tireless defender of open access around the world! Let us hope that CGIAR heeds this message. What could possibly be more fair than ensuring that those who cannot always be sure to be able to afford quality food supplies, at the very least have guaranteed free access to the very research that is meant to help them?